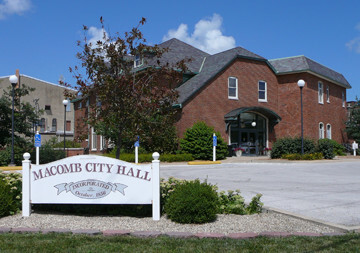 Macomb is a city in McDonough County, Illinois and the home of Western Illinois University. The city has a population of 20,000+. It is positioned about 77 miles SE of the Quad Cities 75 miles SW of Peoria. The Macomb Eagle had a long history, extending back to 1857 at least (which is how far back microfilm records extend). It was effectively a twin of the Macomb Daily Journal during its early years. While the Journal served the Republican Party, the Eagle was the voice of the local Democratic Party (Activate Press). Macomb was originally settled in 1829 on a site briefly named Washington. A year later in 1830, the town was officially founded as the county seat of McDonough County. The name Macomb came from General Alexander Macomb, who fought in the War of 1812. Land grants in the Macomb precinct were awarded to war veterans. Macomb formed part of the large Military Tract set aside by Congress. Growth in the town was supported by the completion of the Northern Cross Railroad in 1855. Western Illinois University began life as the Western Illinois State Normal School in 1899. Macomb is a regional center of education, agriculture, other industries, the arts, and culture. Some of the family attractions include the Ball Fore Family Entertainment Center, Blandin House Museum, University Art Gallery, and the West Central Illinois Art Center.